A cookie is a small unique text file placed on your device when you visit a website which enables the website to identify your device whenever you visit that website. Cookies cannot be used to run programs or deliver viruses to your device. Cookies can only be read by a web server from the same domain (e.g. www.muvola.net) that saved the cookie on your device. gain access to statistics regarding your calls – this will facilitate the choice of the optimal tariff offered by your operator. spot dangers which the child is not aware of in time. The child has to be informed about the app. Think you’re being cheated on? quick tracking will allow you to dispatch tasks among area employees more effectively. You need to inform the users about the app and obtain their consent. from a phone/tablet to an online cloud. Gain knowledge and protect your data! The cloud stores all sent and received messages, as well as information about each entry in the address book. You can access them on-line, even if they have been deleted from your phone. The cloud stores all sent and received messages, as well as information about each entry in the address book. You can access them on-line, even if they have been deleted from your phone. You can search through the messages, sort them chronologically or by thread. You can save them as printable Excel documents. In addition, you can set up a notification and be alerted whenever a specific word is used in a text message. The cloud stores information about the time the call began, how long it lasted, and who made or received the call. Calls can be filtered by outgoing, received or missed. The cloud stores information about the time the call began, how long it lasted, and who made or received the call. Calls can be filtered by outgoing, received or missed. The application allows you to list incoming, outgoing and missed calls. You can search through them by the name of a contact or by their phone number. 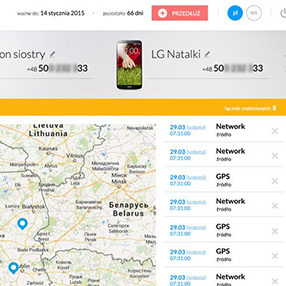 The device location data is collected always, even if the GPS module is switched off. You can track the device on Google Maps. The device location data is collected always, even if the GPS module is switched off. You can track the device on Google Maps. You can also set up a safety zone – you will automatically receive a notification every time the phone is carried outside the selected area. All pictures stored on your phone can be viewed in Muvola. The photos will only be sent if a WiFi connection is available, so you don’t have to be afraid that you’ll exceed your data limit or worried about Internet bills. All pictures stored on your phone can be viewed in Muvola. The photos will only be sent if a WiFi connection is available, so you don’t have to be afraid that you’ll exceed your data limit or worried about Internet bills. If a location was assigned to the image - you can also access this information via the Muvola cloud. Data is transmitted through an encrypted channel. All data has to be authorized and verified. At any moment, with one click, you can permanently remove all data from the cloud. Data is transmitted through an encrypted channel. All data has to be authorized and verified. At any moment, with one click, you can permanently remove all data from the cloud. An easy-to-use panel allows you to modify the selected settings and types of data which you want stored. The application’s operation is invisible to the user, and it occupies a negligible fraction of the available Internet bandwidth. The application’s operation is invisible to the user, and it occupies a negligible fraction of the available Internet bandwidth. There is an option of sending data only if a Wi-Fi connection is available, e.g. when it’s not possible to use the phone’s mobile Internet feature. Your data is safe even if it was deleted before you had the chance to look through it. If there’s no Internet connection available, the application collects all data and stores it in the cloud as soon as the connection is restored. The Muvola cloud always stores the full list of contacts currently saved on the phone. The Muvola cloud always stores the full list of contacts currently saved on the phone. It’s a convenient copy of your contact list. Forgot your mobile and need to make an urgent phone call? No problem - all the contacts are always at hand. the data stored on it? and be able to print them? and if you think that something can be done better - tell us about it! Caution! Don’t be fooled. There are many online services which offer so-called text message spying or phone tracking services. Before paying them, note that their terms of service say that the obtained information is random and only serves for purposes of entertainment. Our trial version is free! You don’t have to pay anything to appreciate the quality of the mobile Muvola cloud. Muvola has really helped me. I’m much less worried about my daughter. I can always find out where she is, especially when she doesn’t answer the phone for a long time. I explained to her that the decision to install the application was made out of concern, not out of a desire to have full control over her. I’d recommend it to everyone. I use the phone a lot in my work, so when I forget it, I have a serious problem. 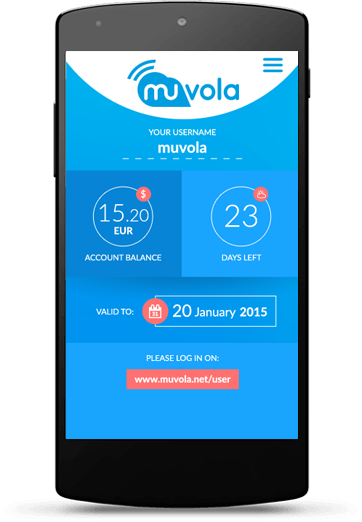 Ever since I installed the Muvola application, it’s been much less of a hassle. I can quickly access text messages or calls, carry out bank transactions and confirm them via SMS. The application is easy to use and effective. Before installing Muvola, I would sometimes accidentally delete the list of calls, or text messages which I had not read, and I would irretrievably lose important information. Now I know that even if I delete something by mistake, I don’t actually lose it for good. Everything is stored in the cloud. I can access what I want any time. It’s very convenient. After logging in, you will see the user panel displaying the most recent data uploaded to the cloud, a summary of the last login time, and account information. Phones assigned to your account are visible at the top of the screen. Use the left-hand side menu to access the full set of data collected in the Muvola cloud. You can fully control what type of data is collected from your phone and stored in the cloud. You can choose which data you want to save in the cloud. You can always remove the information collected so far. When you assign more devices to your profile, each of them can be conveniently assigned a custom name, such as „private phone”. You can view the recent location of the phone on Google Maps. Tracking is possible even if the GPS module of the device is switched off. You can also automatically receive a notification every time the phone is carried outside or inside a selected zone. Past and recent text messages are always at hand. You can view them chronologically or by thread, you can also search through them by content or contacts. Messages can be saved as printable Excel files. You can search for any, even archived phone calls. If necessary, with one-click you can save the list as a printable Excel file. Take one glance and find out whom, and which telecom operator, you call or text most frequently. Make sure your phone is equipped with the Android system (2.3 or newer). In case of any doubts – contact us. Saving data in the cloud is only possible if an Internet connection is available. Run „Play Store” on your phone. 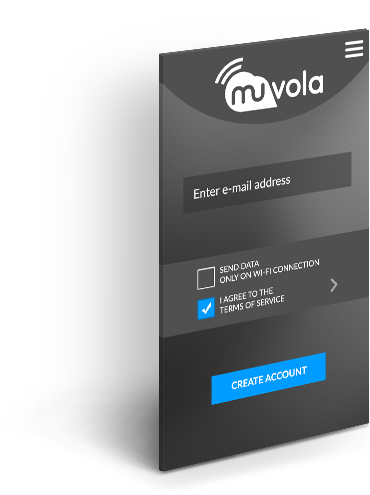 Run the application and enter your email address and new password to Muvola cloud service. On the phone from which data should be collected launch web browser. Application file will be downloaded. Run it and install the application. Run the application and enter your email address. You will receive on it access password. Tap on the screen „hide application” button, and after a few seconds the icon will disappear. Free of charge 3-day fully functional trial period with no obligation to buy! By installing the application you confirm that you accept our terms and conditions. The application downloaded from the app market can be seen on the list of applications in Google Play. The version downloaded directly is installed in such a way that you can’t see it on the list of applications in Google Play. Both versions have the same features. The backup version is visible on the phone as an icon and on the list of applications. 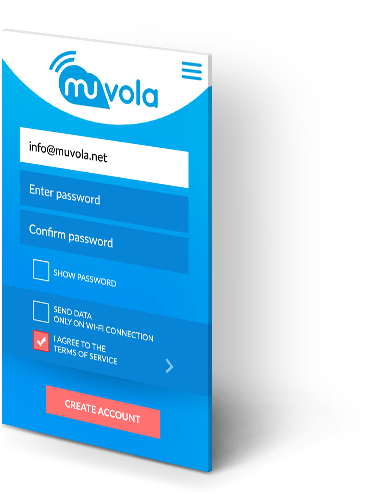 It’s easily accessible if you need to check the account expiration date or change the type of data collected and saved in the Muvola cloud. Both versions have the same features. The hidden version downloaded directly does not appear neither as an icon nor on the list of applications. Price for a single device. or even after it expires. is to pay by PayPal or credit card for 1 year. Only 0,06 EUR per day.